Keeping Your Pet Safe From The Summer Heat! Summer is here and it’s time to enjoy a sweet warm weather again. As a pet owner, you definitely know that pets love summer just as much as we do. It’s the best time of the year for them to bask in the sun and enjoy all that the season has to offer. However, summer heat can be dangerous to pets if not kept in check. It’s hard for pets to keep cool when the temperatures become extensively high because they do not sweat like humans. Dogs, for example, keep themselves cool by panting. But when the temperatures are too high and even the air they breathe is hot, it becomes hard for them to keep cool. 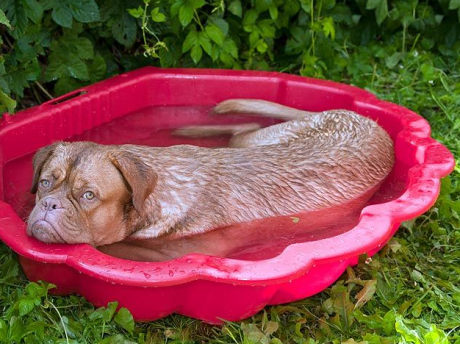 Here are vital tips you must consider this summer in order to keep your dog safe from any extensive heat. Cars get heated pretty fast when parked outdoors, especially directly under the sun. It can take a very short time for a pet to experience heat stroke and possibly suffocate when left locked in a car. For example, on a day when the temperatures are averaging at 75 degrees, the temperature inside a car parked in the shade can rise up to 90 degrees, while that inside a car parked directly under the sun can rise to over 150 degrees. So, your best bet is to never leave your dog in a car at all. The two major ways by which dogs are able to keep themselves cool are panting and drinking. During the hot summer weather, they get much thirstier than we do and therefore have to continually take water to keep cool. Therefore, ensure that they always have access to drinking water and also provide for them adequate shade both indoors and outdoors to shelter themselves from direct sun. Cooling off in the swimming pool is one of the best ways to enjoy the summer weather for humans. And for dogs, it’s no different. Provide them with a small sized pool where they can jump in and cool off anytime the heat becomes too much for them to handle. Sunscreen for a dog? Yes! It may come as a surprise to you but dogs too can get sunburns, especially those with light-colored or short coats. Similar to humans, the sunburns can be a painful experience for your dog. Plus, overexposure to sun UV rays can lead to skin cancer. Consult your veterinarian for the best sunscreen to use with your pet. It is important that you keep your dog engaged during the summer. You can take him with your on picnics, hikes, swimming, runs, walks, and all those activities that he could not enjoy during the winter. Exercise helps keep the pet fit and hence he is able to regulate his body temperature better. Remember, you have to ensure that he has adequate water to drink whenever you take him for these activities. Don’t let your pet suffer in the summer heat! Follow these tips and they will surely enjoy the summer season to the fullest. To keep your pet healthy, don’t hesitate to contact Options For Animals for a chiropractic appointment!